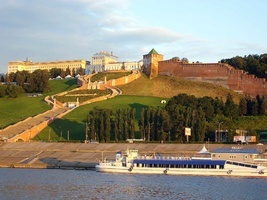 HOME » RIVER CRUISES » MOSCOW VOLGOGRAD ASTRAKHAN VOLGA RIVER CRUISES » Moscow - Astrakhan M/S "Nikolay Chernishevsky"
Moscow - Astrakhan M/S "Nikolay Chernishevsky"
City tour by bus will take you to the most famous areas in Moscow within the boundaries of the Garden Ring and the Boulevard Ring. You will drive by Kremlin, Red Square and Kitay Gorod area, Tverskaya, Arbat and Zamoskvorechje areas. The overview will include famous landmarks like Red Square and Kremlin, Novodevichy Convent, Luzhniki, the White House, area along Moskva River and other notable places of interest. Visit to the Tretyakov Gallery is included. Today you will get aquainted with the Red Square and Kremlin area. This is where you will see the famous St. Basil's Cathedral, Mausoleum, Historical Museum and GUM store. Inside Kremlin the main landmarks are three Cathedrals of the Assumption, Annunciation and Archangel, dated back to the 15-16th centuries, Ivan the Great Bell Tower, Tsar Bell, Tsar Cannon, Hall of Facets and Terem Place. Inside visit to 1 cathedral. In the evening the ship embarks on its Volga voyage. Everything is unusual in Kostroma that is the central square is called "The Frying-pan" by the locals and the fire observation tower looks more like a church or palace in empire style. The city is justly considered to be the home of the Romanov royal family and the Ipatyev Monastery became the family's sacred place: it was from there that Mikhail Romanov was called to take the Russian throne. 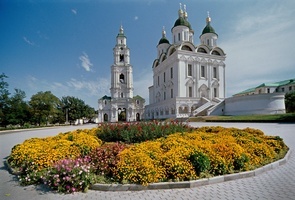 The capital of the Tatar Autonomous Republic (Tatarstan) is often called the “Pearl of the Central Volga Region”. Founded in the 13th century by the Mongols, who at that time occupied Russia, it served as the seat of the mighty Golden Horde or “Tatar” Empire. Presently, it is the city of 1 million inhabitants (half Russian, half Tatar) and absolutely charming with a unique blend of the Muslim and Christian cultures. Kazan is the birthplace of the Russian opera singer Fyodor Chaliapin and of the great ballet dancer Rudolf Nureyev. The history of today's 1.5-million resident city dates back to the 16th century. Founded in 1586 as a fortress to guard Russian lands against relentless nomadic forays. Samara was but a far-flung peripheral settlement until 1851 when the city became the center of the newly formed Samara gubernia (region).Vibrant development of the city began in the second half of the 19th century with the construction of stonework mansions, banks, public buildings and industrial facilities. Most of them still stagger with the diversity of architectural styles and the elegance of shapes. It was then that Samara received its theaters, museums and the public library. Founded in 1590 by the Russian Tsar Ivan the Terrible, Saratov is the boyhood home of Yuri Gagarin, the world's first cosmonaut. Enjoy the landmarks of the city - the 17th-centuryTrinity Cathedral, built in Moscow baroque style, the greenery of "Lime Tree Park" where one avenue was reserved for boys and the other for girls, the calm pedestrian Kirov street, lined with elms. A city of almost 900,000 inhabitants, Saratov is very lively and the atmosphere there is cheerful. First called Tsaritsyn, then renamed Stalingrad and eventually Volgograd, the city has a unique geographic location on the crossroads of land and waterways which link together Europe and Asia. 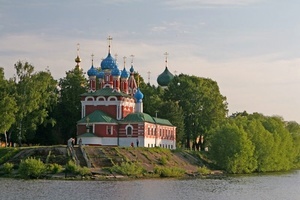 It was established in the 16th century to defend the strategic point where the Volga and Don rivers meet. Volgograd acquired its sinister notoriety during World War II at the time of the Battle of Stalingrad (winter of 1942) which was the turning point for the Russian resistance to Hitler, and for the war as a whole. Mamayev Hill, the site of the battle's fiercest fighting is now a memorial dominated by a 70-m (239-ft) statue of Russia the Motherland wielding a sword. From Moscow to Astrakhan – 3000 km With the completion of the impressive Moscow-Volga Canal in 1937, the capital was finally linked to the great system of waterways that runs from St. Petersburg on the Gulf of Finland all the way to Astrakhan on the Caspian Sea. As a result, it is possible today to follow the entire trade route along the Volga, from Moscow all the way to Astrakhan, the ancient capital of the Tatars. While cruising you will sail along almost the entire length of the Volga River to the edge of the Caspian Sea. Disembark after breakfast. We hope you enoyed your time onboard as much as we enjoy having you as our guests. • Handling the luggage in river ports and on board. • Guaranteed accommodation according to your reservation. • English\French\German\Spanish\Italian speaking board guides. provided at additional cost . at nights, Captain’s bridge tour, etc. • Use of cabin safe. 1) Breakfast onboard is buffet style. hot and cold dishes to guest’s choice. 2) Lunch onboard is buffet style. • Dessert (a choice of 2 variants or fruit). provided – guests choose dishes for the next day each previous day. • 1 bottle of still water (0.33 L per person per day) is provided in cabins. • Welcome Bread and Salt Ceremony on the embarkation day. • Welcome cocktail including 1 glass of champagne or juice per pax. with vodka and blini tasting. • Captain’s dinner with upscale menu. upon returning to ship after shore excursions. • Coffee station for early risers.